Arden Grange Salmon & Potato is a hypoallergenic complete adult cat food suitable for all breeds, that contains 26% fresh salmon making the diet highly digestible, but also naturally higher in beneficial Omega 3 & 6 fatty acids than the chicken and potato variety, so it's ideal for cats that require extra skin and coat support. The salmon and potato recipe is also free from grains and cereals to more closely resemble a cat's natural diet, but like all arden grange pet foods contains NO beef, soya and dairy products making the delicious salmon cat food suitable for those cats with dietary intolerances and allergies reducing the risk of food related digestive disorders and skin complaints. 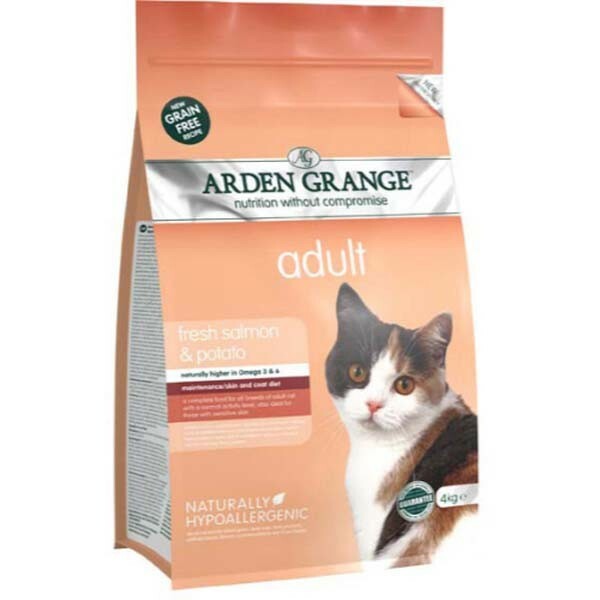 Arden Grange Salmon & Potato contains only high quality, human grade ingredients with a unique blend of nutrients and natural supplements, so the diet requires NO added salt or sugar as palatability enhancers or any artificial colours, flavours or preservatives to increase the taste of the cat food. 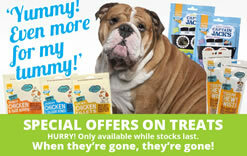 The combination of wholesome ingredients, lots of fresh salmon, beneficial nutrients and natural supplements used in the recipe has been designed to promote the optimum health, vitality and condition of your cat for example prebiotics to aid digestion and the growth of friendly gut bacteria; glucosamine, chondroitin and msm for the maintenance and development of bones; taurine an essential amino acid for a healthy heart and nervous system; Omega 3 & 6 fatty acids for healthy skin and coat condition; cranberry extract for urinary tract health; natural fibres to help prevent fur balls and natural antioxidants & vitamins to help support cats immune system and dental health.